We provide you with the very best value in the industry! If complete piano restoration of your fine grand piano or upright piano is your goal, we can assure you of the finest workmanship possible, using the highest quality parts available. As a registered piano technician, our services include new custom soundboards, full-fitted pinblocks, new bridges and caps, new agraffes, restringing, new damper actions, custom hammers to suit your needs, piano tuning, new keyboards, even new case parts. 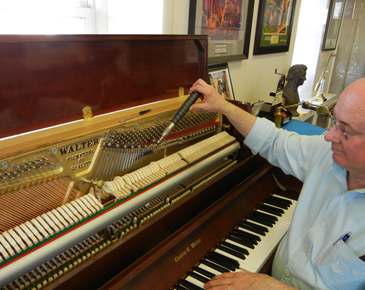 View our before and after gallery of piano restorations we did right here in Allentown. And if you’re concerned about the cost of piano repairs, we offer affordable pricing options. aspects of piano work. Some repairs can be made during a regular tuning visit. Members of our staff regularly instruct at local, regional and international piano technical conferences. We duplicate the satin, hand-rubbed finishes that are on the finest pianos and furniture. Our finishers also are experts in repairing the new high-gloss finishes which are everywhere today. Keeping your piano looking great can be a hassle sometimes, and over time it can lose it’s luster. 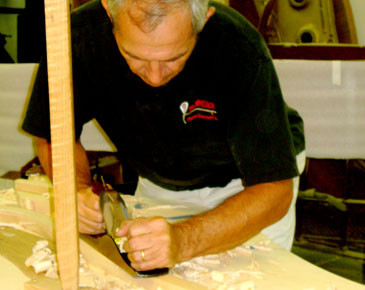 That’s why our team specializes in refinishing pianos so they can look like new again. We are Certified Installers of the Piano Life Saver System by Dampp-Chaser Corp.
for the beginner pianist, or first-time piano purchaser. This allows you to become familiar with the piano so you can see if it is the perfect fit, not just for you, but for your home. There is no better way to find the right piano for you. We want to ensure you find the piano that will last you a lifetime, so we don’t want you to make that decision lightly. We want you to get an in-depth experience with the piano so the choice you make is the right one. While providing a real acoustic piano, it also provides a time frame in which one can evaluate the interest of the student, and form opinions on tone and mechanics of a specific piano, to better inform a subsequent piano purchase. Customers may apply their rental credit towards the purchase of any new piano that we sell. For more information about new and used piano sales call or visit our store. For 27 years John Zeiner &Sons has been providing quality pianos and personal service to assure that the show always goes on at Musikfest. We could not do it without them!